Why? Far and away, the key reason is California Psychic’s demanding screening process. They boldly state that only 2-3% of all the psychics who apply meet their high standards. First, the psychic must make it through a rigorous telephone interview, performing multiple test readings with top-level skilled psychic evaluators. During initial testing, the aspiring California Psychic must demonstrate the highest degree of accuracy in identifying past, present and future aspects of a seeker’s life, and they also must convincingly showcase their acute psychic ability, dedication to ethical standards and customer care skills Then they must undergo a criminal background check. It’s a stringent process and typically takes an entire month. Even after hire, their new psychics are closely monitored to make sure they are adhering to the highest standards. Each new psychic must undergo regular test readings; each new customer of that psychic is contacted by a California Psychics representative to ensure the first reading was a positive and uplifting experience. The result is an unrivalled assurance that you are being connected with the best of the best…and word is spreading. California Psychics has predicted the future over 6 million times since they launched in 1995. 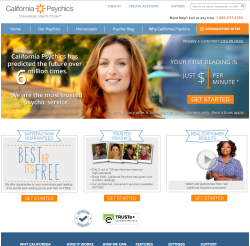 Unlike many other top-rated sites, they play solely to their strengths; California Psychics only offers phone readings – no online chats or texts – any time of day or night, any day of the year. At any given time, there are approximately 400 talented psychics who are ready, willing and able to provide a solid, accurate reading. How do you choose? Perhaps no website we’ve seen gives more helpful options. In addition to empowering you to sort by availability, price and alphabetical name, California Psychics adds two other filtering categories you don’t normally see so prominently: staff picks and customer favorites. If you want to drill down further, California Psychics makes it incredibly simple. You can check off the subject matter (love/relationships, money/finance, past lives, deceased loved ones, for example), the tools (such as astrology, tarot, i-Ching, crystals), the abilities (empath, clairvoyant, channeling, dream analyst) and the style (inspirational, compassionate or straightforward.) A short bio captures the essence of each psychic. It’s reassuring to read that many of them have tapped into psychic gifts from an early age or through a near-death experience, and have, for many years, been able to view, visualize and predict the future. California Psychics takes incredible pains to make sure you’re getting the right psychic reader, even providing scheduling and call-back options if your psychic is currently away or in a reading. Their goal is succinctly encapsulated in their motto: “A positive guide to your future.” They focus nearly exclusively on psychic readings, with the exception of a brief, daily horoscope that can be accessed online. The network’s commitment to customer satisfaction is unparalleled. You can call their customer care specialists anytime – even 3 in the morning on New Year’s Eve – for help with signing up, selecting a psychic or any other related question. If you need help in choosing, they ask what kind of psychic support you’re seeking and recommend based on their experience and the latest information at their disposal. What’s more, this dedication is backed by a 100% satisfaction guarantee. If your reading is not the best reading you’ve ever had, it’s FREE. You simply call within 24 hours of your reading to get connected with another psychic. The terms and conditions of their guarantee are well spelled-out on their website. New customers to California Psychics get a treat: a special $1-per-minute introductory offer. You can choose from an assortment of hand-picked psychics and click “select.” You are then offered the choice of three rate packages: 10 minutes for $10, 20 minutes for $20 or 30 minutes for $30 – an 80% overall savings. And, your transaction will be made in a secure, confidential manner; in fact, your credit card statement does not even reveal their company name or the nature of the charge. Chances are, you’ll want to use California Psychics regularly, and if you do? You’ll earn “karma points”; when you accumulate enough points, you can receive a free reading. All in all, this is one of the best upcoming sites out there – whether you’re seeking to unlock a mystery, clear a path forward, or boost your inner power.